A point and click adventure game in a DOSpunk visual style. Story: A group of youths discover a conspiracy in their town that has destroyed all waves. They take it upon themselves to restore waves to the city! But what is the true purpose of the conspiracy? Runs about 25 minutes based on our playtester. Warning: This story gets a bit dark. Intended for mature audiences. 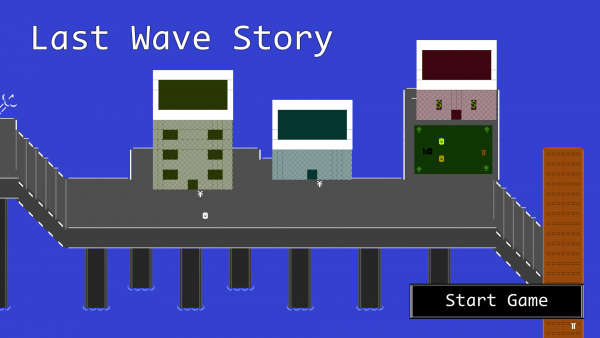 This game was made in 48 hours (not including a few quick fixes after the jam). Intended for play on 720p or 1080p aspect ratio. You may post videos of this game to your youtube channel. I think this is an good game. The audio gives a good atmosphere and has the right sounds. the graphic is also good, but one thing i didn’t really like is the graphic or the houses. First it looks normal but when you move the texture of the houses is also kinda moving. The story is great and i like the puns and other funny parts. 10/10 for this game in my opinion.